Author’s note: Before I left Muddy River, Robbie was generous enough to gift me with two bottles of his product, one each of Carolina Rum and Queen Charlotte's Reserve. I do not normally accept such gifts, but in this case I made an exception. Although I do not consider this payment, the FTC does. As such I am disclosing the info now. And though I had tasted all of the products and made judgements about liking or not liking them before I knew the gift was being made, the tasting notes below are from tonight. Please use this info to judge the relative accuracy of my thoughts on them. It’s raining as I pull up to the gate. I see a sign that bears the logo I’m looking for, but this isn’t the place I pictured in my head when I made arrangements to visit. Though I knew the address included a suite number, I sort of expected that a distillery would need to be a free-standing building. This is a multi-tenant, red brick, light industrial structure with a lot of loading doors. On all sides of the building. Some of the suites have numbers on them. Some do not. None of them have the number I’m looking for. I’m in a rental car, driving around the building on a driveway full of potholes. Finally, I give up. I’m not so dedicated to living up to male stereotypes that I can’t call and ask for directions. We park the car right outside the door that Robbie Delaney, proprietor of Muddy River Distillery, is holding open for us and run inside to try to stay as dry as possible in the pouring rain. Once inside, we walk up a set of stairs and are greeted by a large, empty room, dominated by a large black wall with a smallish still set against it. It looks a bit empty and I’m not quite sure what to think at this point. But because I love craft distillers and I love to talk, I press ahead. It turns out that at the time of our visit, Muddy River Distillery had been in this, much larger, location for about two weeks. (That explains the emptiness.) And Robbie has spent most of that time doing the build-out. He built the large, black wall. He built the raised floor that we were standing on. He built the tasting area in the next room. He’s building a clean room for bottling. He even built the hand rails for the stairs in the entry way. Let me repeat: he did this all in two weeks. And that’s in between bottling batches of his rum. By this point it doesn’t surprise me that he also built the still. Though he built that while in his previous location on the other side of the property. For good measure, he is also elbow deep in his website. Robbie is the very essence of why I love talking to young entrepreneurs: drive, passion, and a real bootstrap mentality. My visit lasts a little over an hour. We spend most of it chatting. Along the way I see the still, impressive as hell when he tells you it used to be a milk tank. 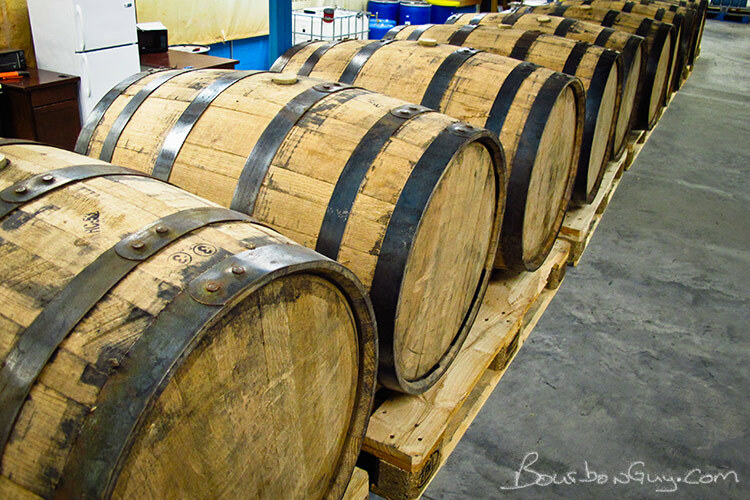 We see the fermentation area, the barrels where the rum ages. We even see the tent that Robbie has set up to sleep in when the nights get long. A rum tasting and another chat, this time about his website, and we’re done. It’s still raining as we run out to the car, but I feel good about this visit and can't wait to come back. 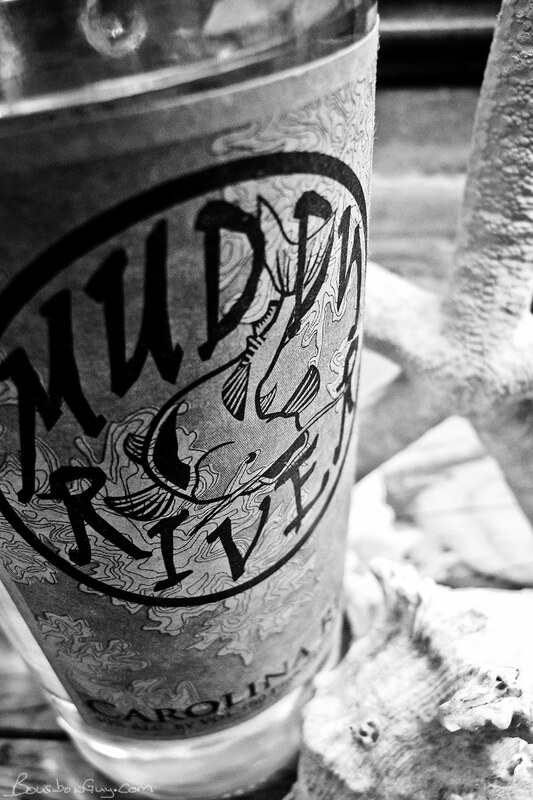 I have a feeling that Muddy River is here to stay. Postscript to my visit: a couple weeks after I get back from North Carolina, I get a note from Robbie that, based on our conversation, he’s launched a new website. 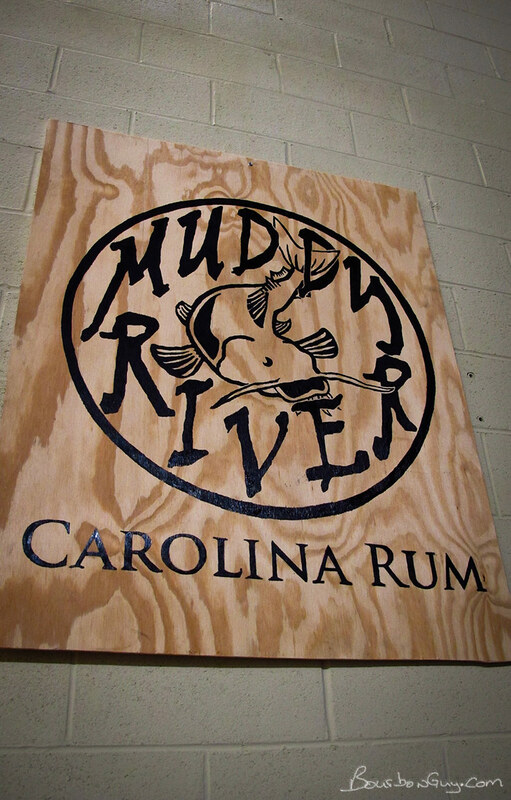 Go check it out at www.MuddyRiverDistillery.com. This logo sign was hanging inside the distillery. I hear he now has a sign outside as well. This still used to be a milk tank from a dairy farm. It was converted by the owner and the unique glass condenser was built by a friend of the owner. These are the used barrels that the aged rum is aged in. The distillery was a very utilitarian space, but I had to admire the fact that he built his own very attractive tasting bar. Details: 40% ABV. Clear as water. Nose: Dried grass with a hint of molasses and dried fruit. Mouth: Thin mouthfeel. Initially: gingerbread, becoming sweeter as it moves back in the mouth. Finish: Sweet and gentle with just a hint of a burn. Thoughts: This is as close to a sipping drink as any white rum I’ve had. It’s really quite good. It’s not quite up to drinking neat, for me. But if it had a little more bulk in the mouthfeel, it might be the first rum that was. I also tried this in a mojito (my “tester” rum cocktail). Let’s put it this way. Until it runs out, it’s now the rum I’m going to use in all my rum cocktails. In fact, I’m regretting giving away the bottle I bought as a gift for a relative because I’m going to have to drive to North Carolina if I want more.